This entry was posted on Thursday, September 22nd, 2011 at 8:44 pm	and is filed under Linux, SEO, Various, Web and CMS, Wordpress. You can follow any responses to this entry through the RSS 2.0 feed. You can leave a response, or trackback from your own site. By the way the Db Cache plugin is causing some wordpress installations I tried it to show empty pages instead of content. On some wordpress installs the plugin showed the website fine and did accelerated, however when trying to edit pages it returned empty pages. After a bit of research on the issues I realized there is a newer (modern) updated version of Db Cache which solves many of the problems of Db Cache. The superior plugin is called Db Cache Reloaded. Installing it and enabling it produced way nicer results and it seems so far the plugin is not breaking wordpress installs. 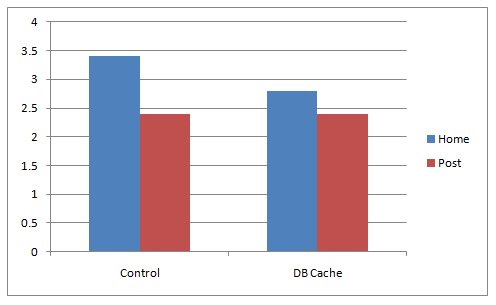 With Db Cache Reloaded, I had some issues enabling it. The plugin complained about some duplicate class declarations. The only work around to make the plugin working is to select to use a Wrapper option from the settings plugins. I only recently realised the importance of caching. It can make a big difference. Thank you for these instructions.